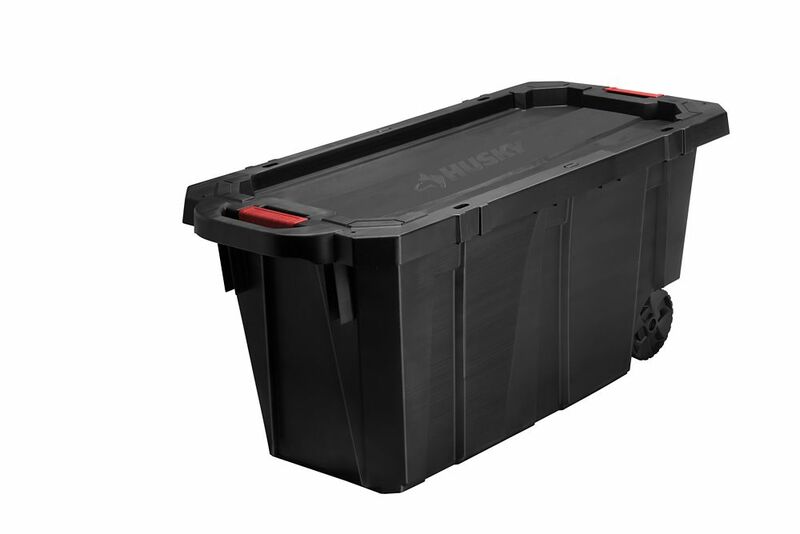 This Husky 170.3 Litre storage tote is designed to handle all your storage needs. Whether it's on the jobsite or around the house. The heavy duty structure allows for a secure setting while freeing up space and providing ample storage of everything from tools to toys. Heavy duty latches keep lid securely in place to insure items remain safely inside. Wheels added to make this the ultimate workers totes for easy transport. This tote is made of heavy duty resin which gives durability and long time use. It is the perfect solution to store all your excess items such as blankets,sporting equipment and toys. It is stackable which maximizes your space needed. It can be stored in the basement, attic or used as garage storage also. This HDX reinforced stackable 102 L heavy-duty tough tote will handle any storage job ranging from general storage needs to extreme storage jobs. The tote includes a black base made from durable recycled polypropylene and a yellow reinforced snap-fit lid to secure and protect your valuables. This tote is a perfect option for the meticulous organizer who demands the very best in heavy-duty storage and protection. Integrated slots make the tote lockable to keep away unwanted intruders. This tote includes innovative tie-down channels that allow it to be easily strapped down for simple transportation. This reinforced stack-able 5 Gal. heavy-duty tough tote will handle any rigorous or extreme storage job. Comes with reinforced snap fit tough tote lid to secure and protect your valuables. Perfect for the meticulous organizer who demands the very best in heavy-duty storage and protection. Lockable to keep away unwanted intruders. If you're into extreme protection, this is the right choice for you. Latch and Stack Tote with Wheels, 170.3 L This Husky 170.3 Litre storage tote is designed to handle all your storage needs. Whether it's on the jobsite or around the house. The heavy duty structure allows for a secure setting while freeing up space and providing ample storage of everything from tools to toys. Heavy duty latches keep lid securely in place to insure items remain safely inside. Wheels added to make this the ultimate workers totes for easy transport. Latch and Stack Tote with Wheels, 170.3 L is rated 3.5 out of 5 by 4. Rated 3 out of 5 by Charmaine from Good value for the price and size. Flimsy latch. Bought this a couple months ago. Sturdy enough for carrying painting tools and supplies. Latch cracked almost in 2 lengthwise the second time that I used it. Latches are poor quality plastic, have to pry open and force over lid EVEN WHEN EMPTY. Seems to be a problem or maybe bad batch. Tried a number of them before picking this one. Don't want to have to drag the whole thing back. Would be happy with replacement latch from Home Depot. Rated 5 out of 5 by Peter from Good Value I use a LOT of storage bins for a mobile sales business to carry inventory. Most cases don't last more than a couple of years the way they get abused. Cases are constantly moved around in all weather conditions. Some cases are made of a plastic that becomes brittle and break easily when it is cold. Gone through lots of those! It is hard to find bins that are this large and the wheels are a bonus! I am going back to buy another one of these and slowly transfer over from my other cases as they disintegrate. Rated 1 out of 5 by DPPlayer from Heavy duty ? Heavy duty ? Industrial grade handle ? Just looks heavy duty,sturdy but when you touch actually is tiny plastic .Doesn't looks heavy duty to me,especially bottom and lid . I can't imagine what going to happen if i stack another 170l box on the top.HDX boxes is way stronger for same money .Very disappointed I will return this one. Is the container food safe?